Eat It Up ! 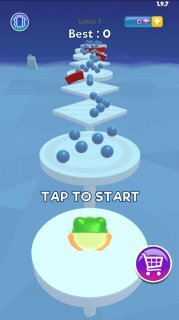 is an arcade game where you help a frog jump from platform to platform, avoiding the walls while also eating up as many of the balls as you can with your long tongue. Eat It Up ! is a pretty dynamic game thanks to a few different factors, such as its addictive gameplay and simple controls. All you have to do is tap on the screen for your tongue to shoot out and eat up as many balls as possible. And the frog will make more or less progress based on how long you can keep it going. The main difficulty is trying to avoid all the walls on the platforms. If your tongue hits one of these walls, the frog will fall, and you can't advance to the next level. So try to get as far as you can by avoiding the walls and still eating as many balls as you can. 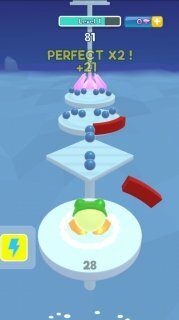 With Eat It Up !, you'll have a great time jumping from platform to platform with this frog on each level. 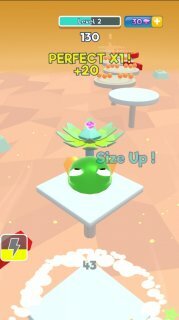 This game has amazing 3D graphics and plenty of action with a cute little frog to boot.